In 2007, my husband and I moved back to the Los Angeles area and into a tiny duplex on the border of Inglewood and Westchester, a stone’s throw from LAX airport. A 6-foot fence was all that separated our back door from an alleyway and a liquor store parking lot where a menagerie of loud, sketchy-looking folks drank, hollered and socialized throughout the day and night. My husband and I both worked full-time 13 miles away (which is roughly an hour commute for those of you unfamiliar with LA traffic). And all I could think about for the first several weeks of living there was the likelihood of someone hopping our fence and breaking into our place while we were away, or worse, hurting our dogs. Then one evening we came home late from dinner and realized we’d forgotten to turn on any lights in or outside before we left. We unlocked the security screen and front door and, as we stepped inside, were welcomed by a low, guttural growl that stopped us in our tracks and made us frantically reach for the light switch. It was Hudson, our 3-year old mixed breed rescue dog. And that’s when it suddenly occurred to me: There is no way that anyone is stupid enough to mess with our place with these dogs in the house. Why was Hudson growling at us? Because he hadn’t yet seen or smelled us before we entered the house. Because he wasn’t used to us arriving home so late with all of the lights off. Because something about our arrival was unfamiliar. Why was he growling at us? Because he’s a DOG. And that’s what DOGS do. We have four dogs now. 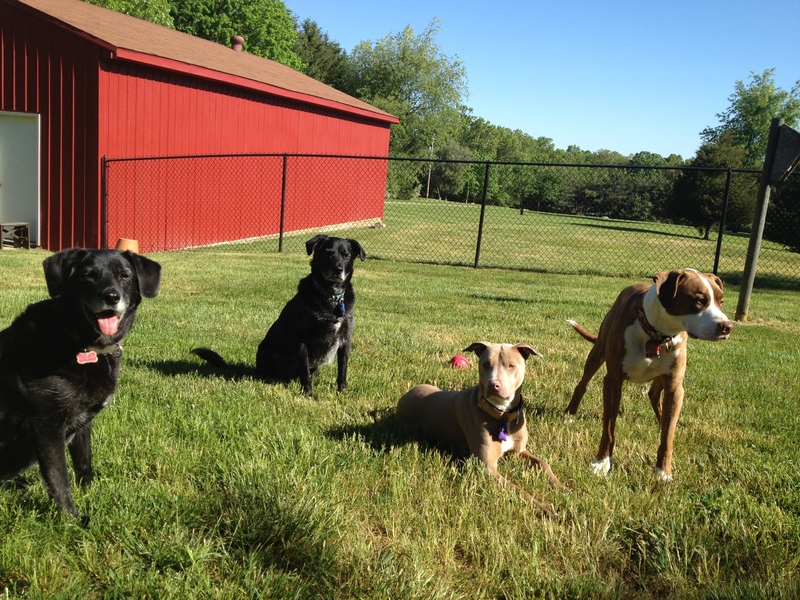 All four are mixed breeds and are well-socialized. And any one (or all) of the four will blow the roof off our place with their barking if someone tries to sneak a mouse wearing an invisible cloak within 100 ft of this house. Which is why I’ve always thought of the term “watch dog” or “guard dog” as redundant. Is it a dog? Yes? Well, then it is, by default, going to watch and guard to some degree. Is it a bunny or a goldfish? Maybe not so much. More importantly, the reality is that any dog of reasonable size is going to be enough of a deterrent to most folks looking to break into a home. I recently read an article on Dogtime.com that I would best describe as problematic. It was titled, “What dogs make the best guard and watch dogs?” And it featured a brief, superficial discussion of “watch dogs” versus “guard dogs” and concluded with an arbitrary list of dog breeds that do and don’t fit those bills. Remarkably, the article failed to provide one single reference, piece of evidence or expert opinion to support the advice it offered to dog owners. So, I tracked down some actual experts in the field of dog training and animal behavior and asked them what advice they had on the subject of obtaining a guard or watch dog. I would have breeders breed for ease of socialization to strangers, and I’d train against [protective/guarding behaviors]. I’d socialize like crazy, teach soft mouth [handling] and purchase a burglar alarm! 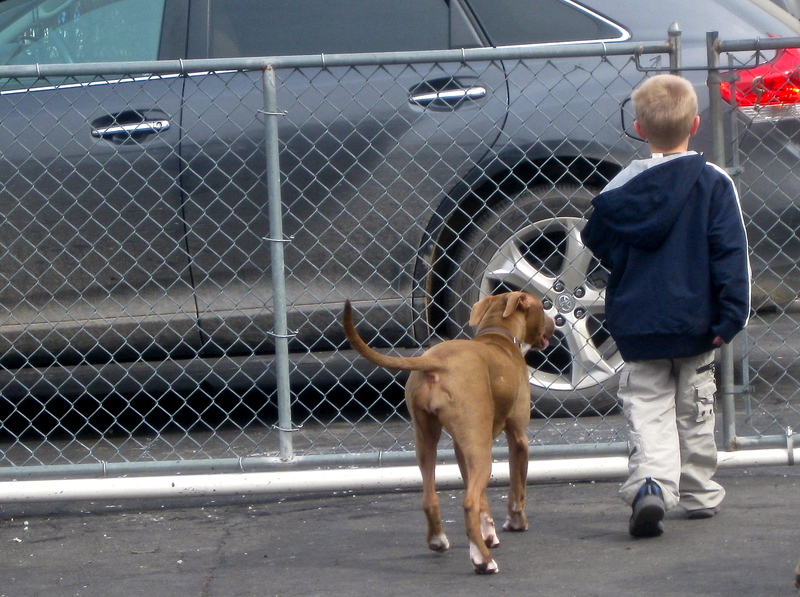 Dogs can’t tell the good guys from the bad guys: they discriminate familiar and unfamiliar. ANY substantial dog of roughly 45 pounds and up will by default “guard” any home. This also takes ZERO TRAINING. 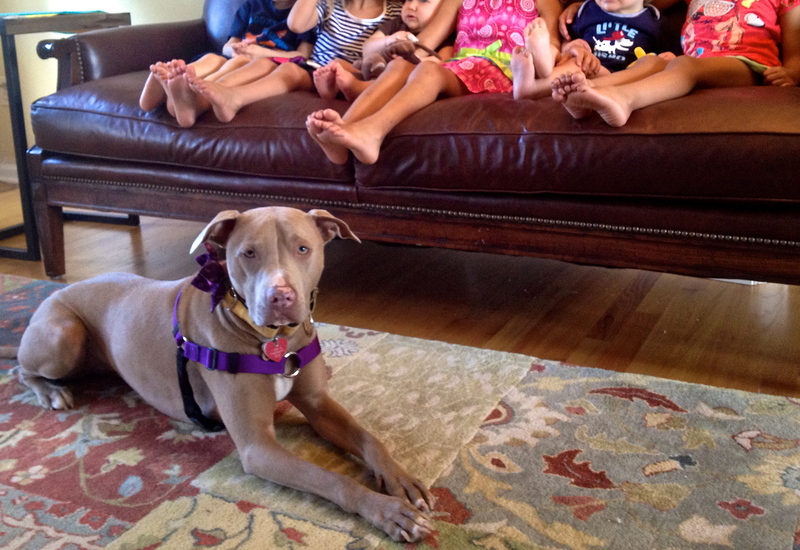 A huge myth is that one needs to “train” a dog to be an “attack” dog or to “guard” the home properly. That is not true and in fact many times those approaches to “train the dog to guard the house” result in an unsound dog . . .
A barking dog or a dog that is startled by someone knocking or attempting to enter a home in a break-in scenario will usually be enough to dissuade the would-be robber. Even the small dogs will work to protect their environment; it is just that a larger dog will be more of a deterrent to the thieves. I think that the allure of watch and guard dogs is rooted in unrealistic expectations. Owners like the idea of a dog who will “protect” them from bad guys, but happily accept good guys. The problem is that dogs are not moral creatures. They have no comprehension of good vs bad, only familiar vs unfamiliar. So euphemisms like “protective of family members” often mean “aggressive toward strangers.” And few people want that. My general belief about dogs that behave in ways that seem “protective, “territorial” or “like a guard dog” is that they are anxious/afraid/socially uncomfortable. [When I have clients who ask me what kind of dog they should get for protection I tell them] “a big one!” I usually recommend something that is a visual deterrent . . . They should be sound, confident, well-adjusted dogs, who also know how to do an activity they have been kindly and fairly trained to do. They need to understand the activity PRECISELY so no mistakes are made, and only extremely skilled trainers should be enlisted to do this kind of work. And I would argue that even a perfectly trained protection dog can still develop problems if he switches handlers and there’s any inconsistency. Which is why I don’t promote protection dogs for anyone other than trained professionals. I’d sooner tell a client to get a large dog, perhaps one that is dark in color . . . and at most, teach it to bark on cue. Most people don’t understand that their idea of a protection dog is actually a fearful/anxious/unstable dog. Getting a dog for protection that displays those behaviors is roughly the equivalent of taking a mentally ill, socially-handicapped human being and making them a police officer. It’s a really bad idea. I tell them save your money and get a burglar alarm. 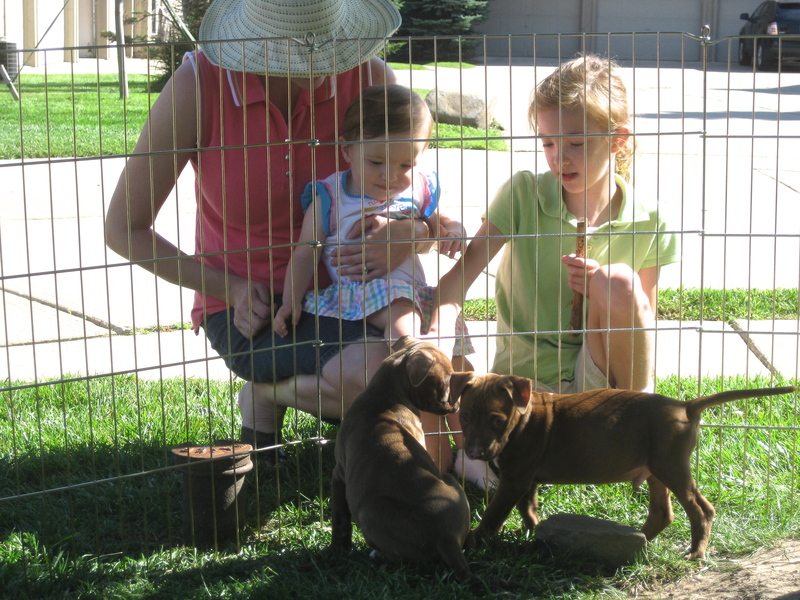 The best ”protection” dogs are those who are well socialized, confident, and self-assured. A dog needs lots and lots of experience with people before he can pick out a truly threatening person from someone who’s merely a little different. To a dog who views everyone as a potential threat, your tipsy neighbor returning from the bar, your nephew with Cerebral Palsy, and the burglar who breaks into your home are all equally terrifying – and all just as likely to get bitten. And that seems to be the one aspect of owning a protection dog that most owners consistently fail to consider: Risk. 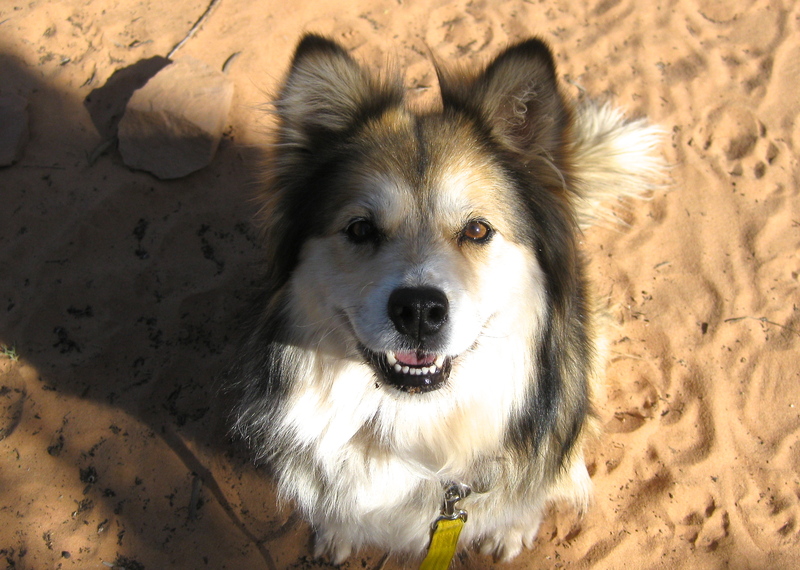 Dr. Patricia McConnell, Certified Applied Animal Behaviorist, professor of zoology at University of Wisconsin-Madison, and author of The Other End of the Leash, frequently finds herself reminding her training clients that by getting a “watch dog” they are often trading a hypothetical risk (a home invasion) for a more tangible one (a dog bite lawsuit). One of the most common types of clients I see are couples who come to me because they have a dog who’s acting aggressively towards strangers, but they welcome that behavior because they want to feel safe in their home. And that’s when I tell them, “You are far more vulnerable to your family losing their home because you got sued over a dog bite.” And that’s usually when they finally get it. The most insistent may come back with “Yeah, the bad guy would deserve it.” To which I reply, “Bad guy? What bad guy? You’re in court because your dog [critically wounded] your kid’s best friend while the three of them were playing in your back yard. Both White and McConnell agree that the risk to friends and family combined with the legal ramifications involved in training a “guard dog” are reason enough to reconsider the idea. What if 911 responders can’t get into your home when you need them to? I’ve spoken with many emergency responders about problems they encounter when they respond to calls at a house, and they regularly cite protective dogs as the biggest challenge they face. And oftentimes what ends up happening is they have to just shoot the dog. And therein lies the rub. At the end of the day, anybody who is truly determined to get into your home will likely just shoot or severely wound your dog. In which case, it doesn’t matter what breed you decide to get. And how safe will you or your family feel then? This whole breed thing is just so misleading. Yes, there are some dogs who in theory were bred for certain purposes but the individual dog’s personality is SO much more important when it comes to that kind of behavior. And anybody who makes breed-based recommendations to someone looking for a watch or guard dog is doing a tremendous disservice to the public. It puts people at risk. Which begs the question, why do sites like Dogtime and Cesar’s Way feel comfortable making such risky, misleading recommendations to the general public, while consistently failing to provide any scientific evidence or expert sources to back up their advice? 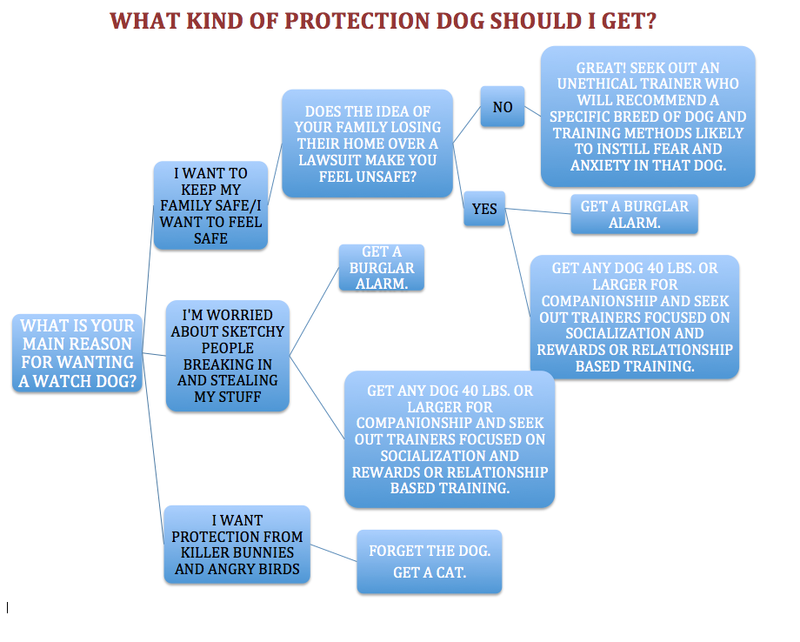 Just for fun, although not entirely in jest, here’s a flowchart for helping owners (or potential owners) decide whether or not they really need a protection dog, and if so, what kind to get. The idea of a dog who will successfully and consistently identify the “good guys” from the “bad guys” while living safely in your household is about as real as the idea of a unicorn that produces free beer and rainbows. A dog, of roughly any size or breed, that is humanely trained to live with you and/or your family will typically sound the alarm when something seems amiss and will usually be more than enough to inspire those undesirables to look for a better house to hit. And if you’re still not sure. Then get a second dog, or a third. Or even better, get an ornery cat. 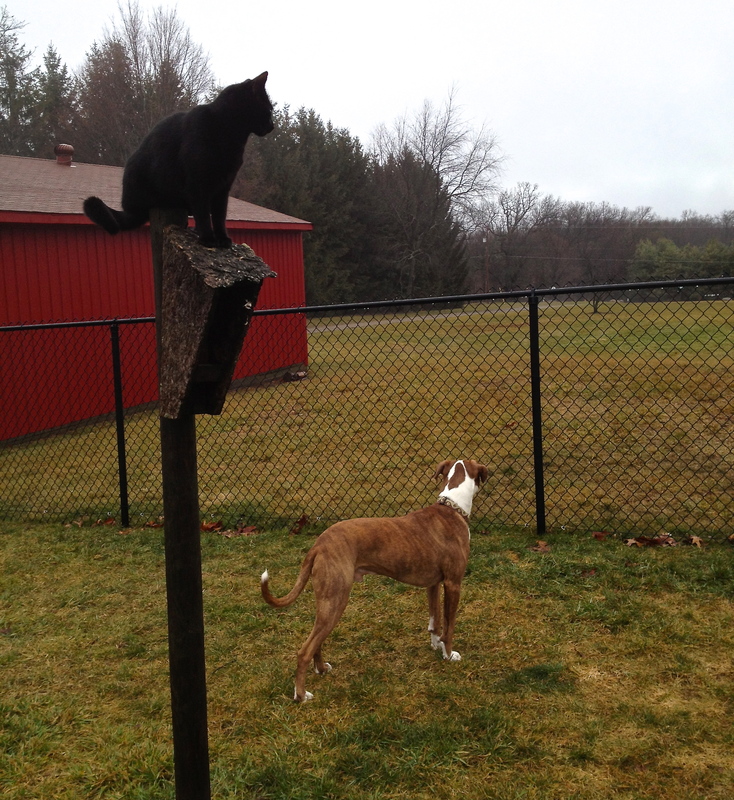 Even the mailman knows better than to mess with a territorial cat. 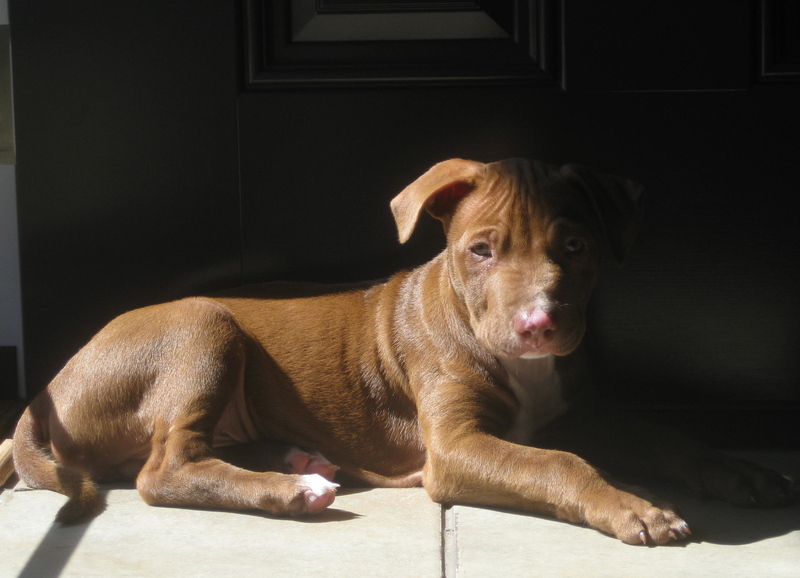 This entry was posted in Advocacy, Animal behavior and training, Animal Welfare, Teaching and learning, Uncategorized and tagged aggressive dog breeds, animal behavior, attack dog training, behavior consultants, best guard dogs, best watch dogs, burglar alarms, Cesar Millan, Cesar's Way, Colleen Dougherty, dog behavior, dog bite lawsuits, dog breeders, dog ownership, dog trainers, dog training, dogs, Dogtime, Drayton Michaels, guard dog breeds, guard dogs, guarding breeds, home invasions, home owners insurance, Jean Donaldson, Kelly Cottrell, Marisa Scully, Michelle McCarthy, most popular dog breeds, obedience training, Patricia McConnell, Philly Dog Training, Pit Bull Guru, protection dogs, theft deterrent, Urban Dawgs, watch dogs, Your Pit Bull and You. Bookmark the permalink. 13 Responses to Can your “protection dog” protect you from a dog bite lawsuit? You know I have small dogs, twice in the last week, I woke up to them barking their heads off. On the second night I got up my courage and walked downstairs. They were at the front door and when I looked out, there were 5 deer in our front yard. Finally the doe jumped over the pile of snow in the street and slowly they all followed. The dogs came back to bed. This was a really good article. Thanks for all your research. There is one breed that was bred to hunt humans and they lived and bred if they could discern the bad guys from the good guys. They were put down if they could not discern bad guys from good guys. You may want to research them. 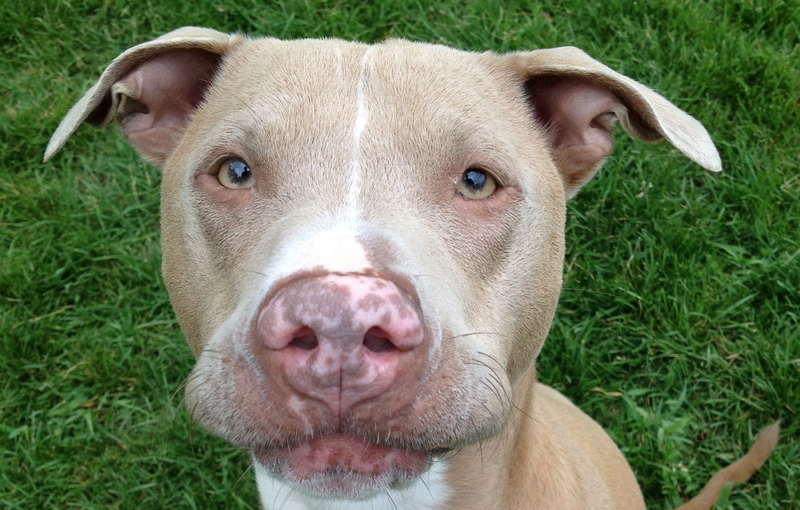 Everyone should read this blog and consider how these ideas should affect your choice and expectations of a dog. In this day and age, I don’t know if I’d consider “just a few bite marks barely broke the skin” fine. I would actually use this as perfect example of a dog NOT identifying a “bad guy” correctly. Sure, we can see from the dog’s point of view why it happened but the man was not intent on doing you harm. I’m not sure how long ago this happened but nowadays you could be sued and would probably lose for this. this happened 18 years ago and im sorry i had no way of knowing at the time what the guy was going to do with the stick when he was heading towards us, ill admit i was scared at the time as i didn’t know what would happen, as for the bite it barely broke skin he didn’t bleed or anything it was more bruising than anything else. What a crock. My dog is a guard dog, not because she is aggressive or plagued by anxiety and nerves but because she loves me. She loves mostt everyone else too, but then some people she just plain does not like and will watch like a hawk instead of trying to get attention . Dogs have excellent senses, can understand emotional atmosphere and can pick up on cues in body language that humans might miss. Basically what I’m saying is, if my dog doesn’t like you, then I have no reason to like you either because there’s probably something characteristically wrong with you that I shouldn’t trust, and if someone acts against me negatively she will then act on it. That to me is what embodies a great guard dog. There’s a big difference between a family dog who picks up on body language (or instinctively doesn’t like someone) and a guard dog who’s been charged with the responsibility to protect your house or family. As the blogger said, in most cases, your dog automatically looks out for you because that’s what dogs do — they naturally protect what’s important to them. But there is real danger — for both the dog and the public — if a dog is distrustful in general, poorly socialized, or simply makes a mistake and misreads a particular person or situation. I don’t agree. I think this article is spot on. Dogs can choose random things to dislike or like, I would never let my dog choose my friends. I have seen dogs like ppl I loathe and vice versa. Dogs don’t have morals. Yes, they can react to people acting out of the ordinary but is that person is acting different because they are trying to pickpocket you, they are drunk, or because they have had a stroke or something that causes them to move differently? My dog and I were on the bus and a drunk guy fell on us. My dog sat up (he was lying on my lap) and didn’t react. I was so proud of him! If he had been a ‘protective’ dog he probably wouldn’t still be here. Yes I would have liked him to scare the flasher off that we met a few weeks back but again if he had reacted and hurt him he probably would have been put to sleep:-( how is he supposed to tell the difference between the harmless guy that actually touched me (and him) and the intimidating guy who didn’t get anywhere near close enough for physical contact? A trainer told us just to get a plain big dog. The size scares folks. A big deep bark, is all one needs. 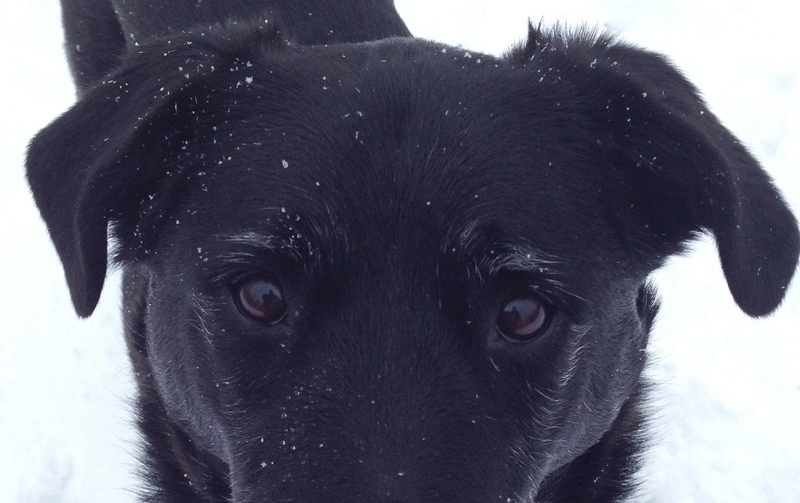 I haven’t trained any of my 4 dogs to be guard dogs or watch dogs; they are my furkids and companions. Nevertheless, all 4 of these dogs are extremely protective of me and always bark whenever someone comes to the door or walks through the yard. I’ve tried to socialize them and introduce them to the neighbors and mailman to get them comfortable with those people. They would undoubtedly go after anyone strange coming into the house without any encouragement from me. The little jack russel terrier is more aggressive than my large rottweiler and I’d be more worried that he would be the one apt to bite than the rottie. So much depends on the individual personality of the dog as they all differ. A “big deep bark” certainly makes people think a dog is dangerous. 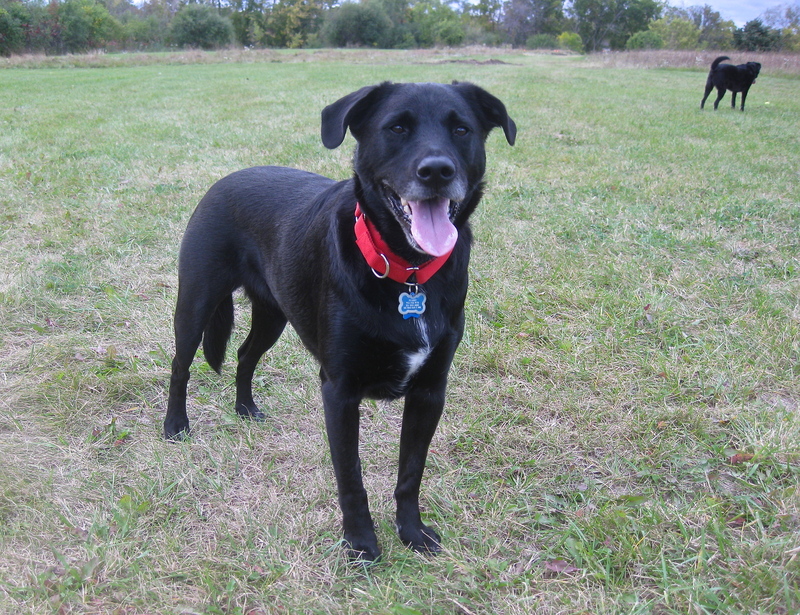 My Lab would bark like that in the house and people who met her later on the sidewalk were surprised to find how friendly this “dangerous sounding” dog was. 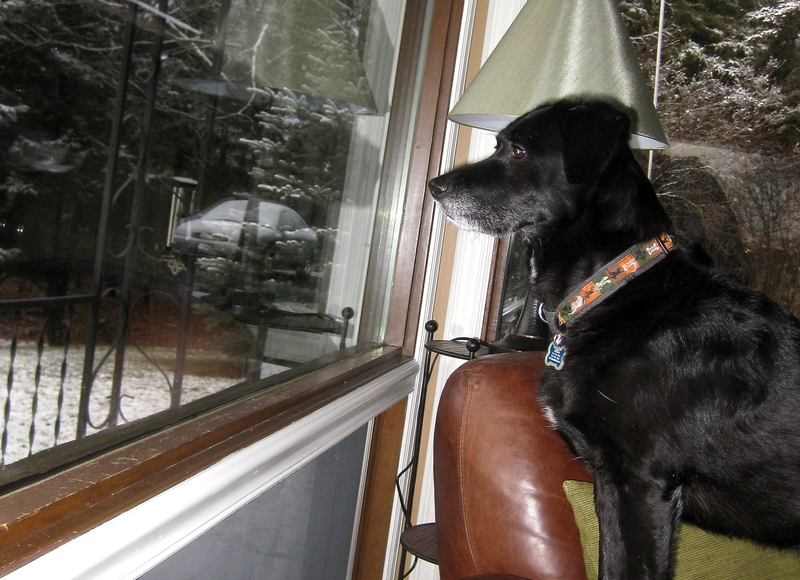 She was also a terrific watch dog, warning of people sneaking around the neighborhood at night.